I lead the supernova group at LCOGT and UCSB. Current members include: Stefano Valenti, Iair Arcavi, and Jerod Parrent. Past members: Melissa Graham, Dave Sand, Ben Dilday, and Federica Bianco. Institutionally, we're a part of the Palomar Transient Factory (PTF), La Silla/ QUEST (LSQ), and Pan-STARRS1 collaborations. I'm a member of the Supernova Legacy Survey and past member of the Supernova Cosmology Project. We found two supernovae in the Supernova Legacy Survey that are some of the most powerful and ancient known. They are 100 times as powerful as a normal core-collapse supernova, which is hard to understand. In a recent Science article, Dilday et al. 2012, we describe our observations of a supernova with several shells of gas around it, that we argue indicates that it is from a recurrent nova. 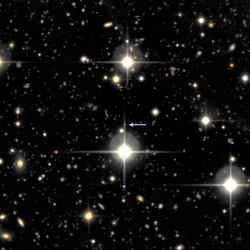 This is the first good evidence of a link between recurrent novae and supernovae. And it shows that there is more than one path to making a Type Ia supernova. 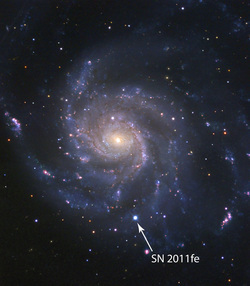 Follow-up research shows that a fraction of other supernovae, called Type IIn supernovae appear to be like PTF11kx, but have historically been misclassified. By BJ Fulton, LCOGT Sedgwick Telescope. The SN Ia group in the Palomar Transient Factory discovered SN 2011fe only 11 hours after explosion, the earliest a thermonuclear SN has been caught. This resulted our first confirmation that the primary star was a carbon-oxygen white dwarf. There was also no shock and no bright radio emission from the secondary star or its wind, making it difficult to reconcile this supernova with the single degenerate hypothesis.